Why Trump is suddenly OK with letting Iraqis into America. 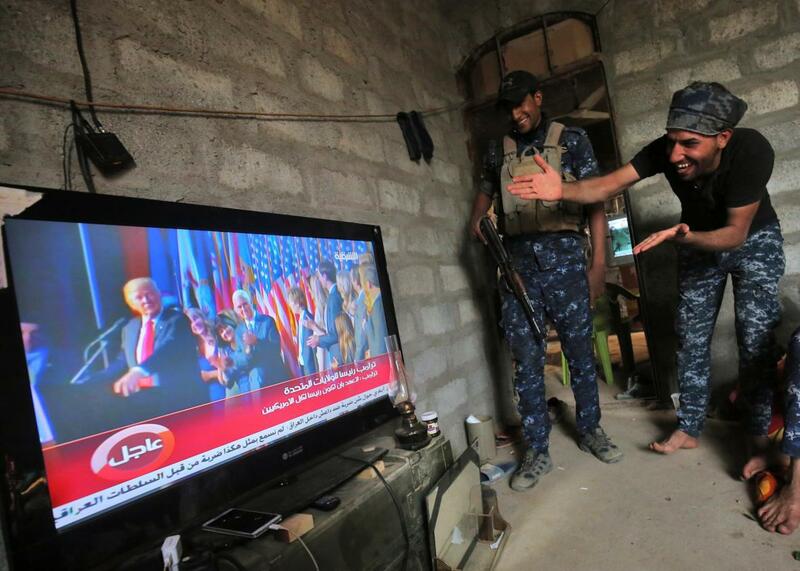 Members of the Iraqi forces in the village of Arbid, south of Mosul, react as they watch Donald Trump giving a speech after he won the election on Nov. 9. This makes sense. One of the most controversial aspects of a ban with many, many controversial aspects was that it initially appeared to ban Iraqis who had worked with the U.S. military as translators or in other roles. After the ban was announced, the Pentagon immediately scrambled to put together a list of Iraqis who had assisted U.S. forces and should be granted exceptions. The Trump administration eventually amended the original ban to allow Iraqis who have been issued special immigrant visas, as many of the interpreters had, to continue to travel to the United States. Even after that exception, it was still not exactly tactically shrewd to actively discriminate against citizens of a country whose soldiers are currently engaged in active combat alongside U.S. troops. The Iraqi Parliament had passed a retaliatory measure banning U.S. citizens from entering the country, but Prime Minister Haider al-Abadi said he would not act on it, given the need for U.S. support in the fight against ISIS. Defense Secretary James Mattis was in Baghdad last month to reassure Iraqi leaders over a number of Trump’s statements, including the travel ban and his repeated suggestions that the United States might seize the country’s oil. With the battle for Mosul entering a critical phase, and the tricky challenges of holding together the fractious coalition fighting ISIS, military commanders don’t need yet another source of tension.